There are already cars on the road with intelligent headlights that can sweep left or right to improve visibility as a vehicle steers into a turn. But Vauxhall/Opel is developing next-generation headlight systems that can keep track of where a driver's looking, and automatically re-direct the lights in that direction. 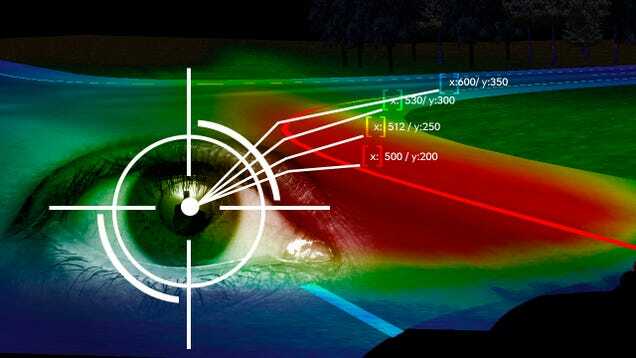 Using a single camera accompanied by peripheral infra-red sensors, the system, which has been developed and improved over the past two years, can scan a driver's facial features and eyes over 50 times every second to determine exactly where they're looking. And it's designed to work in the poor lighting conditions of dusk and evening when a vehicle's headlights are more important to safe driving. That coupled with faster data processing and improved actuators moving the headlights means the path of light can be instantaneously redirected to be in sync with a driver's gaze. But the human eye is an effective tool because it can dart from object to object with frantic speed and efficiency. If a car's headlights perfectly followed the driver's gaze it would be an erratic flickering light show to others on the road. So GM is also developing intelligent algorithms to monitor not only where a driver is looking, but how engaged they are in what they're seeing. So if a driver is just quickly glancing at a passing sign, the headlights won't react and shift away from the road ahead. But if a driver is looking intently at something off to the side, that cone of light will gently flow to the right or left, or up or down, to help further illuminate the hazard or obstacle up ahead.